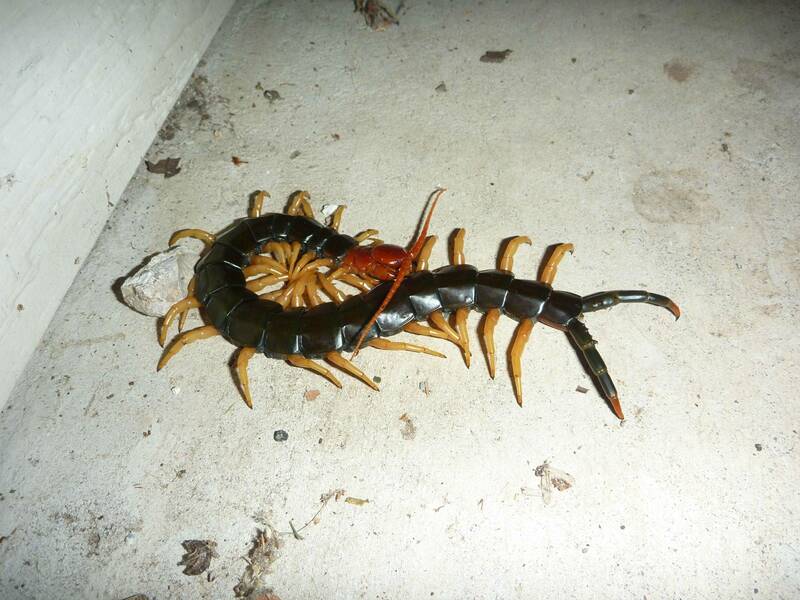 …a picture of a simply enormous centipede. So here it is. This seems unlikely to me, as why would the centipede benefit from this expenditure of poison? How often, when attacked, would the creature actually be walking on its attacker? It seems a very inefficient way of defending oneself, or of pacifying prey. It’s certainly not impossible but I think I’m on the side of Cloudsley-Thompson. Hello again! Missed you and Ruth and decided to drop back in. …And to think that, until recently, I wanted to live in cool, hip Austin, TX! Well, in between the record heat, worst drought they’ve ever had, much higher property taxes than here and this awful-looking critter, I think I’m better off where I am! Reminds me of my (brief) sojourn in Florida. The biggest cockroaches I’ve ever seen, some as long as my admittedly smallish hands, would reside in palmetto trees during the day and it was their mission to fly into the house at night. Gawd, those things were awful. But this centipede has the cockroaches beaten. Thank you ever so much for saving me the trouble of moving to Austin!!! I’ll just be cool and hip here in Tiny Town. I think someone at the University of Arkansas Arthropod Museum has an over-active imagination.